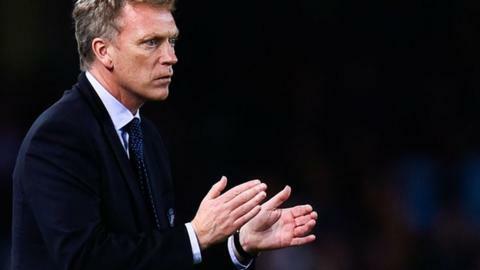 David Moyes suffered his first defeat as Real Sociedad manager as his team failed to score for a second successive game in a 4-0 defeat by Villarreal. Bruno Soriano opened the scoring from a free-kick with the help of the crossbar and the goalkeeper's back. Midfielder Denis Cheryshev doubled the home side's lead with a driving left-foot strike across goal. Substitute Moi Gomez added two late goals after an assist by Cheryshev and a goalkeeping error by Enaut Zubikarai. Luciano Vietto could have made the defeat even more emphatic as he twice struck the foot of the post with right-foot shots. Sociedad registered just two shots on target and the win sees Villarreal climb to sixth in La Liga while Sociedad drop to 14th. Match ends, Villarreal 4, Real Sociedad 0. Second Half ends, Villarreal 4, Real Sociedad 0. Attempt blocked. Tomás Pina (Villarreal) left footed shot from outside the box is blocked. Assisted by Mario. Attempt blocked. Gerard Moreno (Villarreal) left footed shot from the centre of the box is blocked. Assisted by Moi Gómez with a headed pass. Corner, Villarreal. Conceded by Eñaut Zubikarai. Attempt saved. Manu Trigueros (Villarreal) right footed shot from the centre of the box is saved in the top centre of the goal. Assisted by Jonathan dos Santos. Corner, Villarreal. Conceded by Alberto De la Bella. Corner, Villarreal. Conceded by Esteban Granero. Attempt blocked. Manu Trigueros (Villarreal) right footed shot from outside the box is blocked. Assisted by Jonathan dos Santos. Substitution, Real Sociedad. Pablo Hervías replaces Sergio Canales. Goal! Villarreal 4, Real Sociedad 0. Moi Gómez (Villarreal) right footed shot from outside the box to the centre of the goal. Assisted by Tomás Pina. Attempt blocked. Mario (Villarreal) left footed shot from the right side of the box is blocked. Assisted by Jonathan dos Santos. Substitution, Villarreal. Tomás Pina replaces Bruno. Manu Trigueros (Villarreal) wins a free kick in the defensive half. Foul by Gonzalo Castro (Real Sociedad). Substitution, Villarreal. Gerard Moreno replaces Denis Cheryshev. Goal! Villarreal 3, Real Sociedad 0. Moi Gómez (Villarreal) right footed shot from the centre of the box to the high centre of the goal. Assisted by Denis Cheryshev following a fast break. Foul by Denis Cheryshev (Villarreal). Esteban Granero (Real Sociedad) wins a free kick in the attacking half. Substitution, Real Sociedad. Alfred Finnbogason replaces David Zurutuza. Foul by Jonathan dos Santos (Villarreal). Alberto De la Bella (Real Sociedad) wins a free kick on the left wing. Goal! Villarreal 2, Real Sociedad 0. Denis Cheryshev (Villarreal) left footed shot from the left side of the box to the bottom right corner. Assisted by Ikechukwu Uche. Attempt blocked. Luciano Vietto (Villarreal) right footed shot from outside the box is blocked. Assisted by Manu Trigueros. Luciano Vietto (Villarreal) hits the left post with a right footed shot from outside the box. Assisted by Denis Cheryshev. Foul by Ikechukwu Uche (Villarreal). Esteban Granero (Real Sociedad) wins a free kick in the defensive half. Attempt missed. Ikechukwu Uche (Villarreal) left footed shot from outside the box is close, but misses to the right. Assisted by Manu Trigueros. Attempt saved. Sergio Canales (Real Sociedad) left footed shot from outside the box is saved in the bottom right corner. Assisted by Gonzalo Castro with a headed pass. Iñigo Martínez (Real Sociedad) is shown the yellow card. Attempt missed. Denis Cheryshev (Villarreal) left footed shot from the centre of the box is too high. Assisted by Jonathan dos Santos with a cross. Attempt missed. Carlos Vela (Real Sociedad) left footed shot from outside the box is too high. Assisted by Xabi Prieto with a headed pass. Substitution, Real Sociedad. Gonzalo Castro replaces Rubén Pardo. Goal! Villarreal 1, Real Sociedad 0. Bruno (Villarreal) from a free kick with a left footed shot to the top right corner. Ikechukwu Uche (Villarreal) wins a free kick in the attacking half. Foul by Xabi Prieto (Real Sociedad). Attempt missed. Luciano Vietto (Villarreal) right footed shot from outside the box misses to the left. Attempt saved. Carlos Vela (Real Sociedad) left footed shot from outside the box is saved in the centre of the goal. Assisted by Rubén Pardo. Attempt blocked. Sergio Canales (Real Sociedad) left footed shot from long range on the right is blocked.